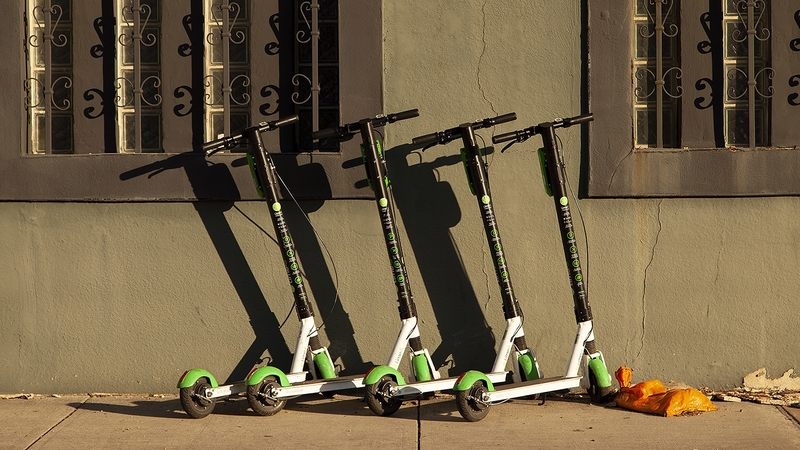 The city’s Transportation Committee, which is composed of five City Council members, placed a moratorium on e-scooter and e-bike permits on Tuesday for the duration of the dockless vehicle pilot program, which ends April 19. 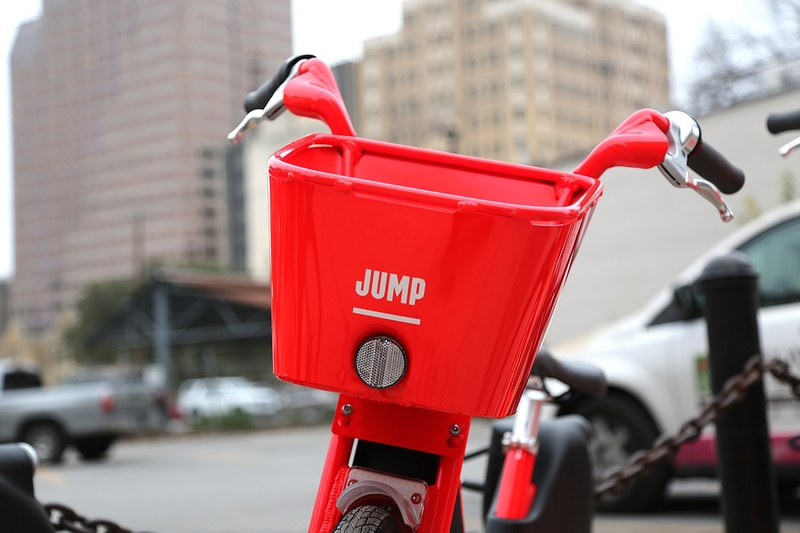 The order caps the number of dockless vehicle permits at 14,000—currently issued to five companies—and prohibits other companies from entering the San Antonio market at this time. 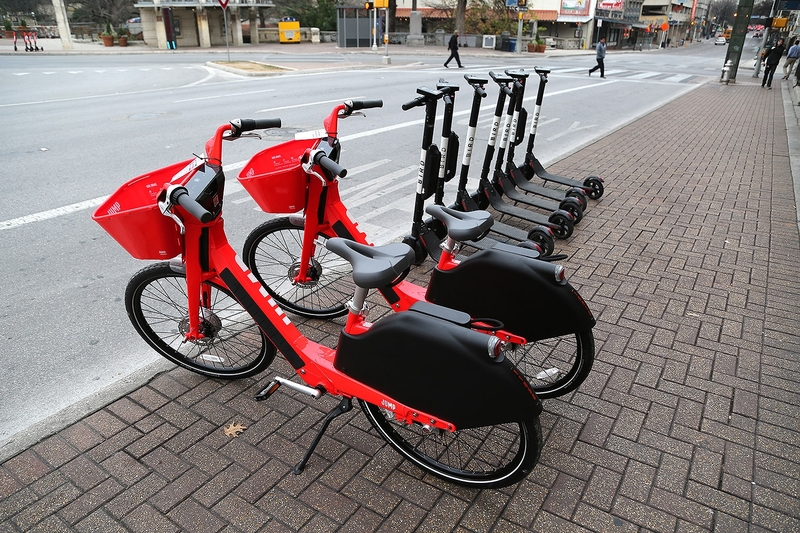 The city of San Antonio has issued permits for 14,100 dockless vehicles to six companies so far. 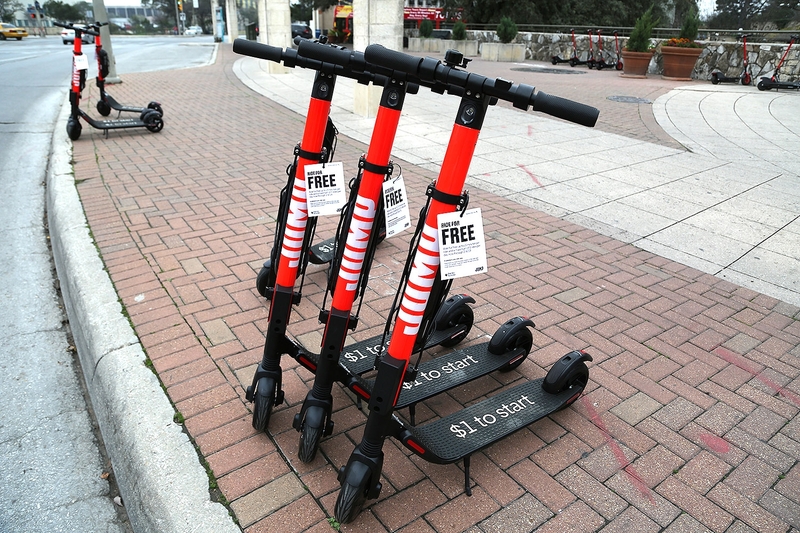 The moratorium will not apply to Spin, which was recently granted permits for 500 e-scooters, but has not deployed them. However, Lyft, which applied for permits for 2,000 scooters last week, will have to wait until the moratorium is lifted to launch. “This is a form of mobility—what we’re uncomfortable with is the overall numbers of (them) and, perhaps, the lack of regulatory control,” District 6 Councilman Greg Brockhouse at the Transportation Committee meeting Tuesday. He added that dockless vehicles are being utilized in the city as viable transportation but need better accountability from operators. 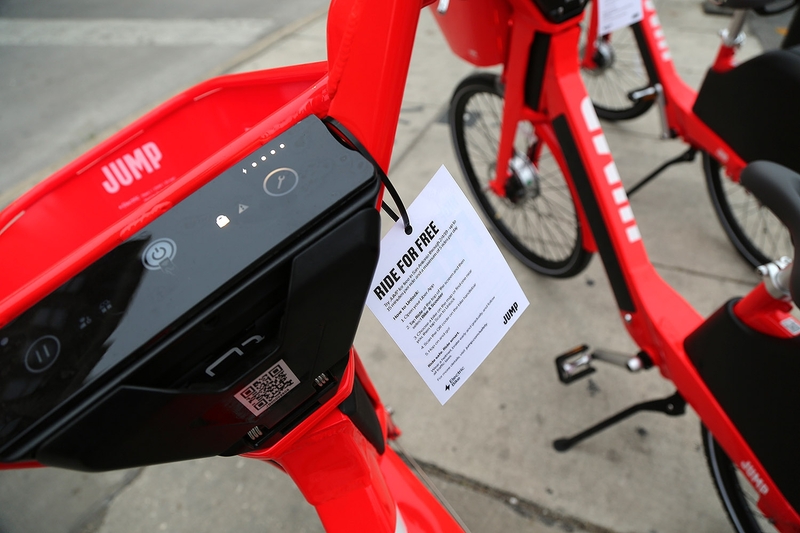 The Center City Development and Operations department proposed other amendments after identifying recurring violations and accidents by dockless vehicle riders. 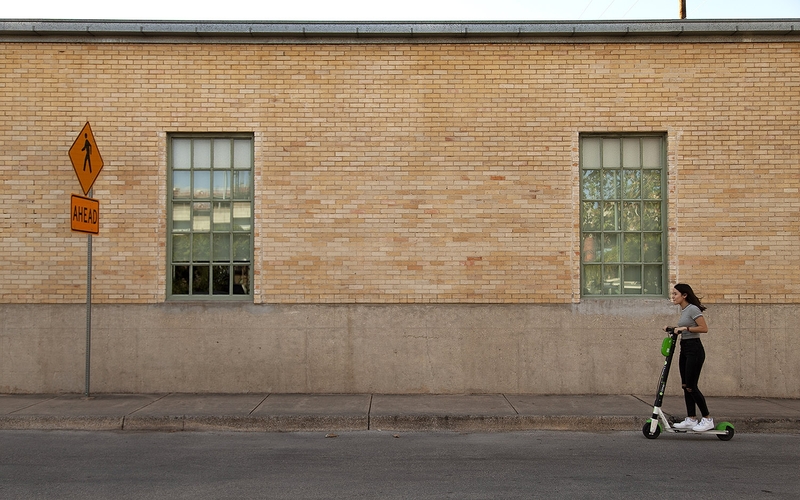 In recent weeks, the city updated its 311SA smartphone app to allow user to report scooter violations. The app, which is used for submitting service requests to the city, has received 556 scooter violation reports this month. 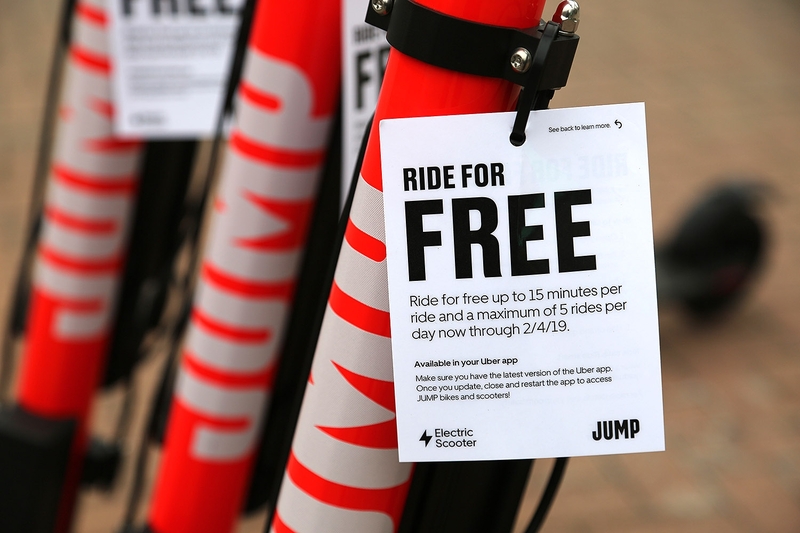 » Impose hours of operation from 6 a.m. to 10 p.m., and require scooters and bikes in the greater downtown area to be picked up daily by the vendor—vehicles must be picked up by 11:30 p.m., and cannot be deployed until 5 a.m. This regulation was proposed to prohibit dockless vehicle usage all night and to alleviate cluttered sidewalks during morning rush hour. » Vehicles parked in prohibited areas may be impounded without warning the companies. The impoundment fee will not apply. 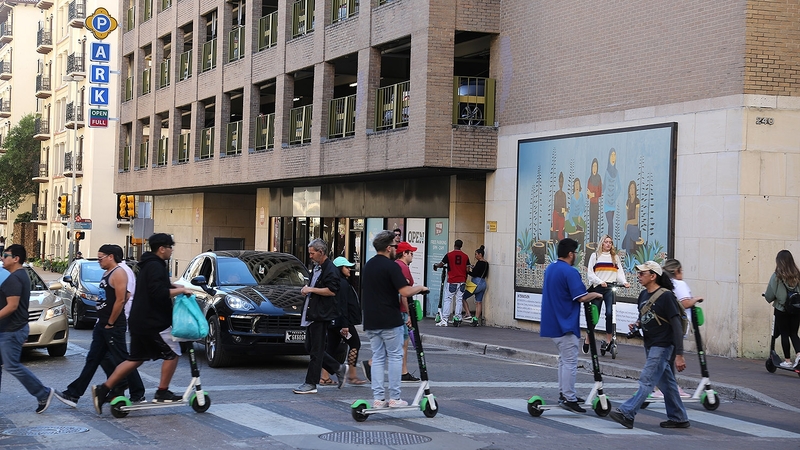 Dockless vehicles found in areas like the River Walk or Alamo Plaza would be removed by the city if their operators do not retrieve them in an hour—or, two hours if the vehicle is parked or deployed in an area that violates city ordinance, like blocking sidewalks and curb ramps. » Encourage the use of designated parking zones—CCDO tested designated parking zones, using stencil and spray chalk, during Rock and Roll Marathon in early December and the New Year’s Eve celebration, where they were used regularly, officials said. 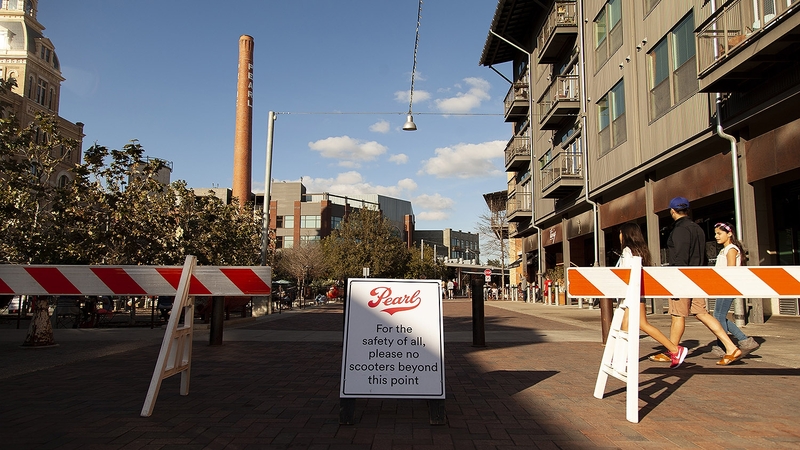 The city is also working to create other parking zones, or “corrals,” for dockless vehicles, which could replace select single curb-side, metered parking spaces. 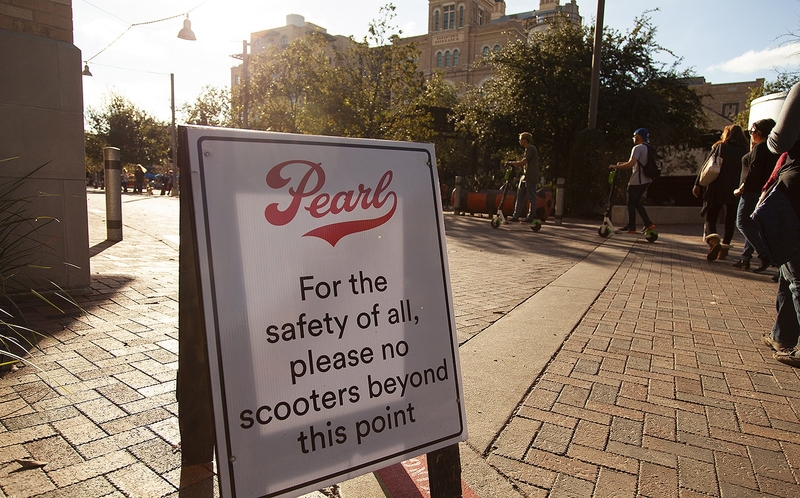 Other amendments to were also discussed, including increasing permit and application fees, prohibiting sidewalk usage, and enforcing geofencing technology to stop riders from entering Alamo Plaza or the River Walk. 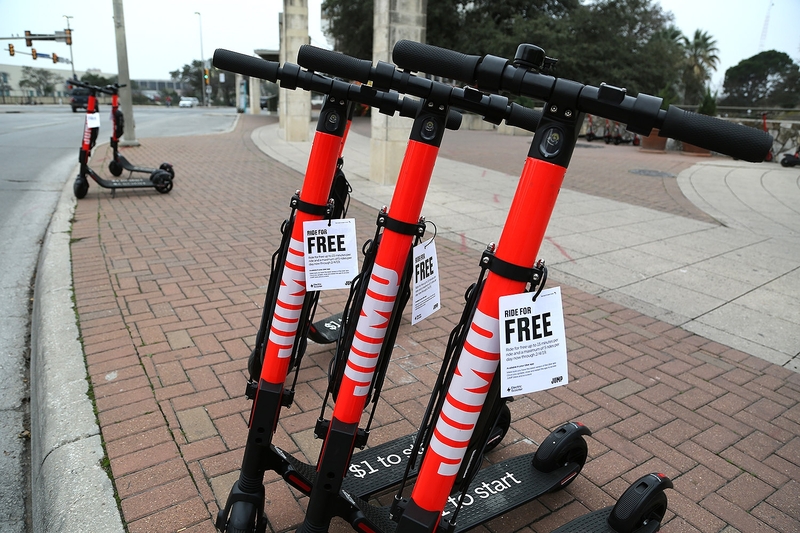 CCDO also wants to increase its number of code enforcers, who move scooters out of streets and from blocking sidewalks, from two to six people, using funds from permit fees to pay for the larger team. 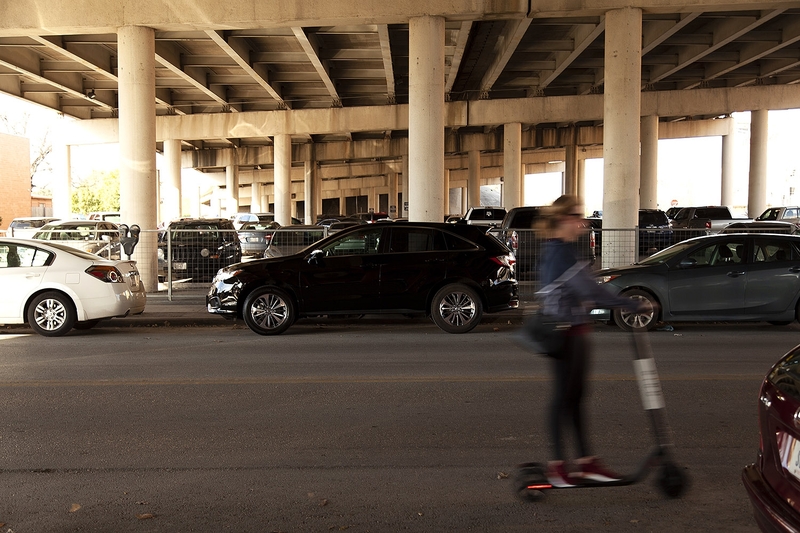 The Transportation Committee acknowledged the increased use of dockless vehicles in the city, with people riding more than 1.2 million times since Dec. 1. As of now, 9,500 vehicles are operational in San Antonio, CCDO officials said. Consisting of scooters (mostly) and bikes, there are 14,000 permits total. Local company Blue Duck is waiting for its 100 scooters to get permitted, but is allowed to operate because it launched prior to the pilot program’s approval in October. 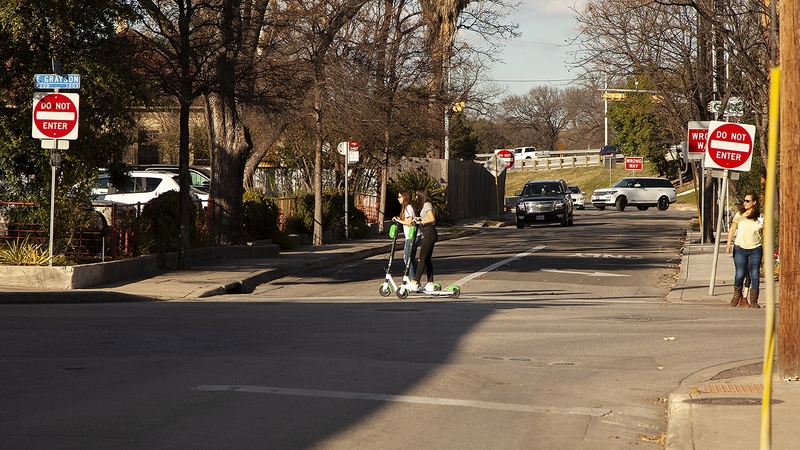 From October to mid-January, there have been 78 scooter-related emergency calls to the San Antonio Fire Department. District 8 Councilman Manny Pelaez said the scooters were a nuisance to police officers, who enforce riding violations. His constituents who live near the University of Texas at San Antonio’s main campus regularly find them thrown in their yards. Pelaez mentioned dockless vehicles as a potential solution to the first mile-last mile problem of public transportation in the city—the oft-quoted ¼ of a mile people are comfortable walking to and from public transportation—but still had reservations. 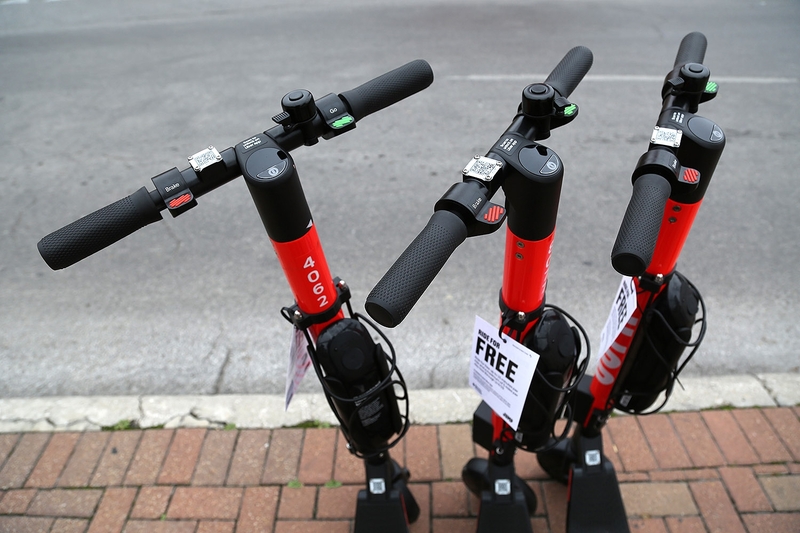 “I’m not sure 12,000 scooters in the downtown area, clogging up our sidewalks, would make anybody look at it and say, ‘Wow, there’s a solution’,” he said. Pelaez wants a strict curfew on their usage, a severe reduction in the amount of permits issued, and a better partnership between the city and dockless vehicle companies. 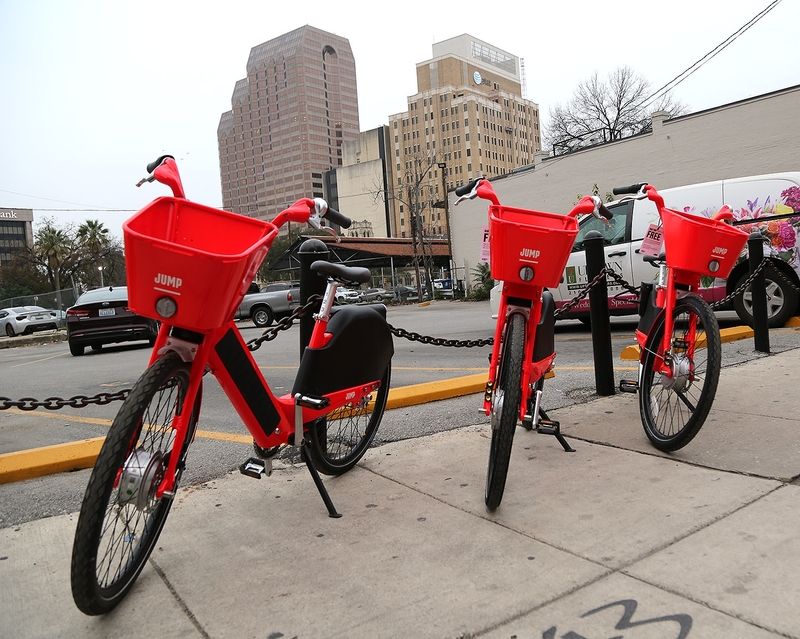 District 5 Councilwoman Shirley Gonzales was more welcoming of dockless vehicles, and also wanted a partnership between the city and their operators. “We could actually go further to make it safer, not restrict it,” Gonzales said. She said the dockless vehicles should be treated as a transportation issue and not a recreational one. 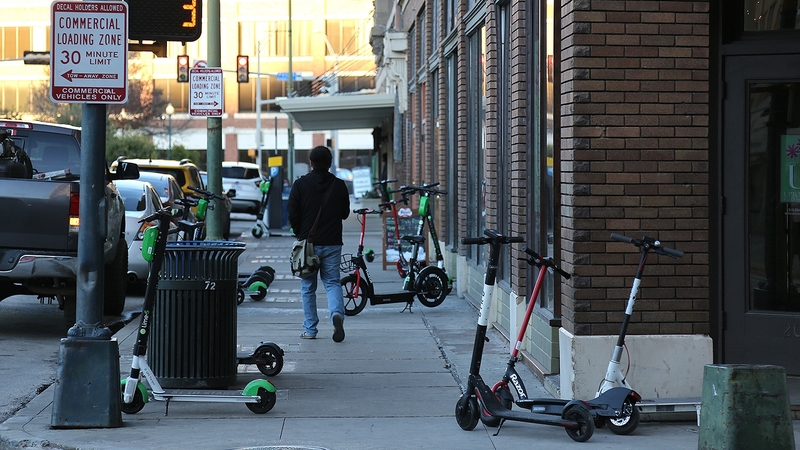 District 7 Councilwoman Ana Sandoval said regulations for dockless vehicles were not strong enough, specifically asking for more signage and data from the operators. “I would challenge you to come back with something strong,” she said. CCDO is requesting access to “the raw data” from dockless vehicle operators to research why people are using them, where they’re going, where most accidents are happening, and where to place them in the city after the pilot program. The city also relaunched its dockless vehicle survey, which you can take here.